It is been reported that the Jerusalem-based Debkafile was temporarily put out of action Saturday evening by a cyber attack. Debka, a news site, specializes in military and political analysis. It's still not clear whether this was a denial of service (DoS) attack. At about 19:00 local time the site went down. Immediately authority sent out a note to subscribers that both its English and Hebrew sites had been under attack. The site's publishers were not available to make any comments. It's clearly assumed by everyone that it's the result of week-long conflict between Israel and Hamas. Just to note that the Israel Defense Force sent its troops into Gaza in a move to smother missile fire. DreamHost is running a New Year's promotion right now. 95% off a 2 year hosting agreement which works out to $10.47. QuickOnlineTips posted a promotion code earlier today that gives you a steep 95% discount off the 24 month package from DreamHost. Use the promotional code 202 when prompted for a promo code during checkout. For $10.47 you get unlimited transfers, bandwidth, a free domain registration and all the perks that come with a full account like unlimited MySQL databases, email accounts, and domain hosting. DreamHost also has a plug and play web control panel for quickly adding in popular components like WordPress. I went through the websites and found out about an affiliate program which states that QuickOnlineTips benefits directly from people using their promotional code. I'm perfectly comfortable with that for web hosting that costs $0.44 a month. Featuring an 8.1 MegaPixel Camara, C905 Cyber-Shot phone launched by Sony Ericsson. It's a first dual front slider Cyber-Shot phone by Sony Ericcson. A 4-inch scratch-resistant display 240x320 pixel 262,144 color TFT screen, Wi-Fi connectivity, Bluetooth, FM radio RDS and 2 GB Memory Stick Micro (M2) are few of the exciting features of C905 Cyber-shot. it has a wider range of photographic functionality such as Xenon flash, face detection, up to 16x digital zoom, auto-focus, smart contrast and image stabilizer, Red-eye reduction and unique sliding lens mechanism. Some more camara attributes include BestPic, Photo fix, Photo flash, Photo light, Video stabilizer, Video record, Video light, Picture and video blogging, photo feeds and PicBridge printing. Few other things which I spotted and liked are, GPS capability with geo-tagging photos, Media Player with support for MP3, TV-Out Cable ITC-60 to double up as a TV Box, Access to Net Front Web Browser with social networking sites to upload images on online blogs. The exclusive set that comes embedded with a CCR-70 USB adapter that enables users to transfer photos is available in ice silver, copper gold and night black colors. The Indian users can avail the latest Sony Ericsson C905 Cyber-shot handset at a price of Rs. 34, 495. 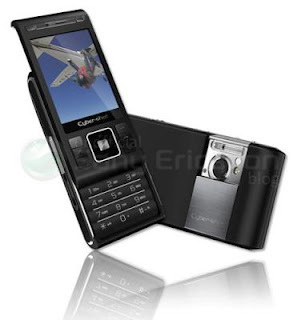 Get Full Overview of C905 Cyber-Shot from Sony Ericsson Here. Download Managers or Dwonload Accelerators are used to increase the overhaul download speed, since they utilize the entire bandwidth of your internet connection even if you download from slow websites. They are also used for retrieving files and complete websites, meaning downloading full websites with graphics and scripts. Most popular download managers are Internet Download Manager (IDM) and Download Accelerator Plus (DAP), but you have to buy them to use em in full. Here is a Free Download Manager which does everything that others do. This Free Download Manager includes: Integration with Internet Explorer, Opera and FireFox, powerful scheduler, downloading from mirrors, adjusting traffic usage, ZIP file and audio/video preview and many more. Free Download Manager (FDM) offers you a vast variety of options to control and schedule your downloads. This is a light-weight but powerful download manager. FDM can resume your broken download so that you needn't start it from the beginning after casual interruption. You can resume unfinished download from the moment when it was interrupted. Also this program warns you if resuming isn't supported by the servers. It allows you to make a decision about the downloading. So with FDM you save your time and money. Capability to split download into several sections allows you to increase download speed up to 600%. FDM can connect to the Internet at a set time, download the files you want, launch any program, disconnect or shut down your computer when it's done. This download manager allows you to specify the settings of network usage, such as login and password, maximum number of connections, default group, etc. So you can avoid adjusting these settings every time you need to create new download from the server. The version here provided is 3.0.844 which is a Final Pick, that features numerous tweaks and innovations, such as prioritized and partial torrent downloads, support for Chrome and Safari web browsers, avast! Antivirus, multifile metalinks, FDM plugins, and many more. A Chennai based IT solutions company Novatium and BSNL (Bharat Sanchar Nigam Limited) launched most awaited Low-Cost Computers on Friday. This will boost the number of computer and internet users in the country. Also, this will help achieve a target of 9 million broadband connections across the country in the next couple of years. These unbelievably low-cost computers are given a name "Nova netPC". Nova netPC, available in two packages (down payment of Rs.1,999 and a monthly charge of Rs.199, and an upfront fee of Rs.2,999 and monthly subscription of Rs.175), is available at BSNL’s outlets in the city. Anyone would think, how could a computer be this cheap? Well, the answer is this: The user is provided only with a set top box, keyboard and mouse. And most hardware functions of a computer will be managed by a central server. Most of the widely used applications will be available to the user. The central server will facilitate access to the BSNL’s broadband conduit, for which the user will need to subscribe to any of the DataOne monthly plans. It does not carry the burden of the CPU, software, hard disc, and applications – all these elements reside in the central server at the administrator’s end. It has a simple architecture – based on that of mobile phone and media player chips. This reduces the cost of the device. It is multimedia enabled, with the capacity to provide real-time multimedia experience. It is compatible with Windows/Linux/Solaris operating systems. It can support multiple USB peripherals (USB pen drive, USB hard disk, USB printer, digital cameras, etc. ), speakers and microphone. It is an appliance-like device – all you need to do is to switch on and log in. It is Internet ready - there is no need to approach Internet Service Providers for Internet access. It consumes about 5 W of power – hence there is no issue of increasing electricity bills. It has the capacity to be connected to either a VGA monitor or a television. Hence the user can access computing and entertainment through their televisions. It is compatible with the regular home environment and does not require an air-conditioned environment. Making a choice between a Desktop PC or a Laptop will no longer be an issue, said Mr. Kuldeep Goyal, Chairman and Managing Director of BSNL. He added, the total number of broadband users in the country was only 5.25 million, which was less than 1 per cent of the population. In developed societies, the penetration levels were as high as 60 per cent or more. Hackers have gifted a great gift to all iPhone Owners who don't wish to be connected with AT&T. Now you are free to use the iPhone with the carrier of your choice. It's a relief for all those who wish to use an iPhone, but there's no AT&T coverage in their area. Well T-Mobile is a favorite of the expatriates, with a lower data cost per month, but then they don't get Apple's gorgeous Visual Voice Mail. But then it's a new year and a new gift for all from iPhone Hackers. The iPhone G has finally been unlocked. Just a couple of hours back, the unlocking software called Yellowsn0w, created by a group of hackers calling themselves the iPhone Dev Team, is now available as a free download. Unlocking is different from "jailbreaking," which has been possible with the iPhone 3G for a few months now. That gives you the ability to load software applications not approved by Apple, such as an app that lets you use the iPhone's 3G connectivity as a modem for your PC, hundreds of games, extensive customization of backgrounds and sounds, new ways to organize all those apps, and a whole lot more. But Unlocking is already done and you can now follow step by step instructions to get your iPhone work for a carrier of your choice. YellowSn0w is out and it’s ready to rock. Click Here to learn step by step on how to unlock your iPhone G.
If you're an avid gamer and want a few extra weapons or lives to survive until the next level, this FreeWare cheat database can come to the rescue. A Cheat-Code Tracker tracks several popular PC Action and adventure Games. 504 PC Games, 110 Walkthroughs for PC and 202 Console Cheats are represented in this new version from Strategy Games, Adventure Games to Action Games. This Database represents all genres and focuses on recent releases. As you can see in the picture above, games are listed alphabetically in the left-hand window. When you highlight a game, the relevant cheat is displayed in the right-hand window, with convenient buttons that let you print the selection or save any changes you´ve made. If you need help with the latest and greatest games, CheatBook should be a big help. If you have installed the CheatBook - DataBase 2001 V4.0, CheatBook-DataBase 2002, CheatBook - DataBase 2003/ 2004/ 2005/ 2006/ 2007 or the new CheatBook-DataBAse 2008, You will be able to update your DataBase directly. You can download this CheatBook 2009 Here. File Size: 3.3MB. Earlier I used to record any songs I play on internet on to my Audio Cassettes. Since audio cassettes are out dated now, it requires something which can record songs I play on Radio, Podcasts or on any other websites. Sites like Raaga provide millions of songs to listen online. But sometimes it happens that you do not wish to login to internet, go to that particular site and find and choose a song to listen to. In such cases, recording a song to your computer can be very helpful. I have found a very small and attractive software which records everything you hear from your Computer's Speakers. 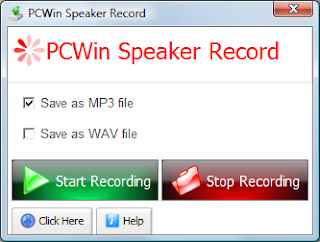 PCWin Speaker Record - You can save songs your record as mp3 or wav files. It records at 128 Kbps, which is a goo CD quality. You can record from Internet radio stations. Grab audio from any web site, podcast, Internet Radio, DVD or CD as it plays. You can also record Voice Chats online with your loved ones. It feels great to hear their sound later in future. In addition to thist, there are many websites which provide audio tutorials for everything, which you can record, save as mp3 or wav, transfer to your iPod, Cell Phone etc and listen to while you're traveling or walking. As you can see, it is very easy to use. Select mp3 or wav file format. Click 'Start Recording' and when you are ready to stop recording press 'Stop Recording' button. Then save your newly created mp3 or wav file and play it anytime. You can play your saved recording with Microsoft media player, Video Lan, WinAmp or any media player. PCWin Speaker Record requires the MPEG Layer 3 Audio Encoder. Download Encoder Here, and run the installer. Download PCWin Speaker Record Here. Fitness of each part of body, including Mind, can be tested on primary basis through various small tests. I was visiting my cousin's place and there he invited me to take this test. This is a real Neurological Test. This test is very easy to take. Just relax, sit comfortably and feel calm before you take the test. This primarily decides the overhaul fitness of your Mind, and this doesn't certify the actual medical test. If you have passed all of these 3 tests. You can cancel your annual visit to Neurologist and Optician. I wish you have a wonderful and a healthy year ahead. Reliance Communications, part of the Anil Dhirubhai Ambani group, on Tuesday announced the launch of GSM-based cellular services in 14 circles. The company has completed the GSM network roll out six months ahead of schedule by investing Rs.10,000 crores so far. This nationwide GSM rollout will include over 11,000 towns. "We will be doubling our GSM coverage from 11,000 towns and 3 lakh villages to 24,000 towns and six lakh villages over the next few months. ", Mr. Anil Ambani Said. RCom's (Reliance Communication) GSM Network is the first nationwide ‘enhanced’ EDGE network, a technology that would offer the fastest Internet access speeds available to Indians. Additionally, through their global partnership on both GSM and CDMA, their customers will be able to roam internationally to more than 200 countries on more networks at attractive rates. RCom's nationwide GSM rollout has been a very large project, wherein Reliance has once again proven its execution skills. They received the GSM spectrum only in January this year, which is less than 11 months ago. Since then their network rollout has been completed and more than 11,000 towns and 340,000 villages will be part of their GSM offerings to begin with. In summary, their number one CDMA network will now be supported by India’s world class GSM network. With this, Indians will have the unique proposition of being able to choose between two nationwide world class networks and have access to the largest handset range available of any operator in India, of over 300 different handsets. The launch of GSM services came just two days after the 76th birth anniversary of the company's late founder Dhirubhai H. Ambani. It was on his 70th birth anniversary Dec 28, 2002 that Reliance had launched its mobile phone services. Delhi Traffic Police is expected to carry hand-held devices, which works on GPRS or CDMA technologies. The device is able to help policemen to get the past record of the driver and vehicle on the basis of vehicle number, name of the driver, parentage and driver's license details. The Internet being what it is, web designers do not have a hard time finding resources. However, there are times when you have to call in the big guns. Courses for Web Designers from Universities like MIT, Indiana, British Columbia, Washington, Stanford, Alberta, Berkeley and many other prestegious universities are made available for everyone. You can access more than 60 different courses, which cover everything to become a successful Web Designer - From Design Theory to Internet Culture. All of these, available to you completely free of cost. These courses follow exactly the same pattern as that of in the actual university. You'll actually access the resources from the University Website. Many of the courses are available in 3 different mediums - Book - Voice (Sound) - Video. Access all these material from College Degree. Special thanks to Jessica Hupp. Comments are appreciated!!! Most of the embedded videos on websites are FLV Videos (Flash Video). Also, All the videos available on YouTube are FLV Videos. The downside of the Flash Videos is that one cannot edit it without a Licensed Editor or Converter. Flash Videos are not compatible with Windows Movie Maker. Further more, if you want to transfer Flash Videos to your Cell Phone, you are required to convert it to 3GP format. FLV Editor Pro can be very handy tool to complete all of these tasks. Moyea FLV Editor Pro is a wonderful Flash Video (FLV Video) editor. You can add watermark, subtitles and special video effects, trim, crop, and merge the files. Just import FLV and output multiple video formats, FLV, AVI, 3GP, MPEG, MP4, WMV, etc. Enjoy the fun of personalizing your Flash videos. Insert special effects like Emboss, Purple, InvertColor and more. The program can meet the requirement for personal or business use. The output videos with different codecs can be transferred to portable devices and PowerPoint for presentation in public. In brief, it is really a professional all-in-one FLV editor. You can go to this Give Away page and grab a license of this $50 software for free - just make sure that you act quickly as the giveaway expires tomorrow. Remote Computer Software lets you access any computer (anywhere in the world) remotely at your desktop computer. You can see the screen of the remote computer as it is on your PC, and you can use your mouse and keyboard to operate on that computer. Such softwares are widely used by professionals who provide Support Facility. Also, Many of the companies use such softwares and allow all it's employees to work on one remote computer. So that, all the work done is saved on one main computer [Server]. There is one popular Remote Computer Software - UltraVNC. UltraVNC is designed with a user friendly interface. It displays the screen of the other computer via Internet/Network on your screen and you can work on it as if you were sitting in front of it. If you provide computer support, you can easily access your customer´s computers from anywhere in the world and resolve helpdesk issues remotely. Your customers don´t have to pre-install software or execute complex procedures to get remote helpdesk support. UltraVNC allows you to remotely control a computer over any TCP/IP connection. UltraVNC emulates the destination computer to make it look as if you were in front of it. Download UltraVNC. The only downside of UltraVNC is that, it is over-bloated and uses a lot of embedded registry & installation files. There comes AMMYY Admin. I recommend this software simply because AMMYY Admin connects remote computers within some seconds and without any installation or configuration. It has got all the features which UltraVNC provides. AMMYY Admin is a complete system for remote computer access. It's reliable and accessible way of providing remote computer assistance and remote teaching for your clients, employees, friends or family from anywhere in the world. Download AMMYY Admin. Both of the Remote Computer Softwares provided here are Free of cost. These are FreeWare and widely used world wide. BitTorrents sites are highly potential for scammers and spammers. It becomes number one choice for them to attack because millions of users are accessing torrents everyday. To avoid this threats, VerTor has come up with an innovative idea. It has a software that checks every torrent on the site for Viruses, DRM and Password Protected Archives. In addition to this, you can preview the contents of torrents before you actually download it. Badly moderated sites are repeatedly spammed with fake torrents. And it is not that nicely moderated sites contain 100% safe torrents. So, VerTor [Verified Torrents] goes one step further in moderating. This site actually downloads every file to check for viruses, DRM and other threats. Not only that, to give a user a torrent what a title says, VerTor takes several screenshots of a video file, so that user can actually verify which movie is to download. VerTor provides 20 Seconds Preview of a Music Track, so that a user can hear a sample. It also extracts an archive and list the files contained in it. On an average day, 6000 torrents are downloaded, and between 2000 and 2500 torrents are verified and get published. There I see a little downside in VerTor. Since it takes time to verify each torrent, a torrent requires a day or two to be appeared on the site. This may sound problematic for those who want to catch up with a Live Football or Rugby Match that aired a day back. Currently there are 138439 torrents verified, and more than 5000 were removed because they contained a virus or a passworded archive. In addition, the site’s moderators blocked another 14445 torrents for different security reasons. The founder of the VerTor, Alex states that they started to use a new anti-virus software this week, which shoud be resulted in higher percentage of virus recognition. Other than verification, VerTor provide us with another user friendly feature. It allows users to download torrents in their own browser with BitLet. BitLet is a web based BitTorrent Client. You can use this feature by clicking the "Download From the Web" button on the torrent detail page. If you are one of those who is not familiar enough with BitTorrent to spot the bad stuff yourself, VerTor may be of your choice. This site is compltely ad-free and founder says he will try to keep it like that for as long as possible. You can access VerTor Here.